2. Hover over the Subscribers tab in the Navigation bar. A drop down menu will appear. 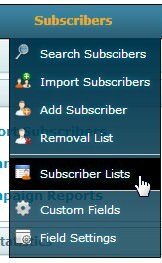 Look for and then click on the "Subscriber Lists" option from the drop down menu. A new page will load. 3. Locate your subscriber list from those that are shown. On the right hand side click the Settings button. 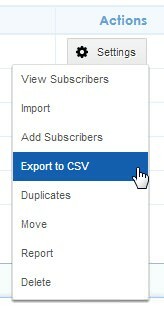 Select "Export to CSV" option. 4. A popup screen will show you a couple of download options: select the option that you'd like → Click the "Continue" button. (You're Subscriber CSV will download to your computer).